The mine begins as a small upper-surface blotch, from which corridors radiate. Wile these become longer and more numerous a secondary blotch develops. Frass in pearl strings. Pupation within the mine. 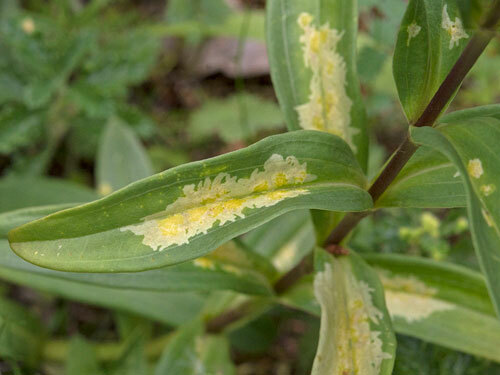 The front spiracula of the white puparium penetrate the plant epidermis. 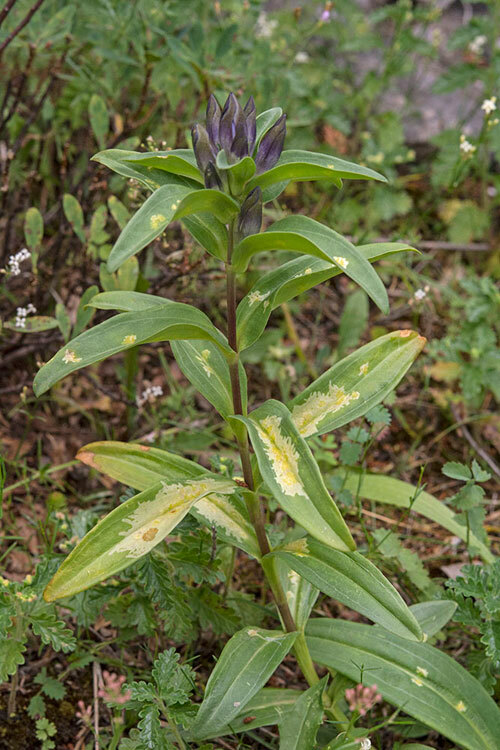 Centaurium erythraea; Gentiana asclepiadea, cruciata, lutea, pannonica, pneumonanthe, punctata, septemfida, tibetica; Gentianella; Veratrum album. Larvae in July and August-September (Hering, 1957a). From Lithuania to the Iberian Peninsula, and the the Netherlands to Italy; also Bulgaria (Fauna Europaea, 2007). Phytomyza gentianae; Ph. veratri Hering, 1941; Chromatomyia hecate Pakalniškis, 1998. In small plants the larvae can also mine the stem (Buhr, 1964a). Beri (1971e) describes the larva from an unindentified Lamiaceae in India. It is most improbable that his identification is correct. Ahr (1966a), Beiger (1960a, 2005a), Beri (1972e), Beuk (2002a), Buhr (1941a, 1964a), Černý & Merz (2007a), Černý & Vála (1996a), Csóka (2003a), van Frankenhuyzen, Houtman & Kabos (1982a), Godfray (2015a), Griffiths (1962a), Hartig (1939a), Hering (1926b, 1928a, 1941a, 1957a), Huber (1969a), Kvičala (1938a), Maček (1999a), de Meijere (1926a, 1941a), Pakalniškis (1989b), Robbins (1991a), Sasakawa (1961a), Skala (1936a), Skala & Zavřel (1945a), Spencer (1972a), Starý (1930a), Süss (1982a, 1992a), Surányi (1942a), von Tschirnhaus (1982a, 1999a).